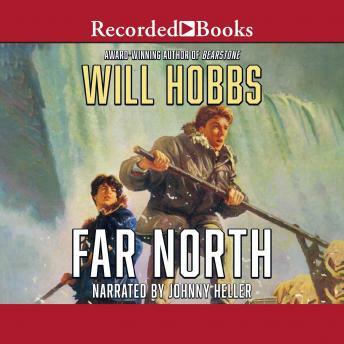 Two boys and an old man survive a harrowing waterfall accident to find themselves stranded in the remote MacKenzie mountains of northern Canada. Fifteen-year olds Gabe and Raymond have the same birthday, but come from vastly different cultures. Gabe was raised by his grandparents in the Texas hill country, and Raymond is from a native village in the Northwest Territories. The old man is Johnny Raven, Raymond's great uncle. Luckily for the boys, he's a traditional Dihnay Indian who knows the old ways of winter survival. With winter fast approaching, and food running out, they must all work together to keep from becoming trapped in the howling wilds. Whether the group is eating porcupine or shooting the icy rapids, Johnny Heller's voice draws maximum excitement. The author of Bearstone, and numerous other award-winning books, Will Hobbs is known for his thrill-a-minute wilderness adventure stories featuring teens.